TACU’s 5-Spot Savers Club is best described as an opportunity for elementary school students to deposit their money (pennies, nickels, quarters…) at school. Through collaboration between the Tomah Area School District and TACU Credit Union, 5-Spot Savers Club provides an opportunity for elementary students to learn the value of money management while at school.  5-Spot Savers Club is available to all elementary schools in the Tomah Area School District. Every Tuesday, students can make deposits into their TACU Credit Union account while at school. For every $10 they deposit, they receive a $0.25 deposit into their account as a reward for continuing to save. 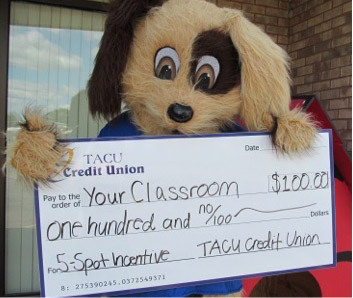 At the end of each school quarter, TACU Credit Union donates $100 to the top three classrooms from three different schools who make the most in-class deposits. It’s a great way to reward teachers and students for developing good savings habits. Experience. Hands-on experience with money management & saving. Convenience. The program provides a convenient and safe way to begin to save money at school. Small deposits are allowed and encouraged. Explore Saving. Allows a controlled environment for students to experience the benefits of regularly saving money. Earn Interest. The money earns interest in the student’s 5-Spot Savers Club Account and students can watch their savings grow with a quarterly statement. Earn money for your classroom with 5-Spot! Opening an account is free and there is no minimum deposit. Free T-Shirt for every new 5-Spot Savers Club account after the first deposit is made. Call TACU today at 608-372-4736 or send back in our Reply Card to PO Box 940 N. Superior Ave., Tomah, WI 54660.